Will the IMF Become Irrelevant Before It Changes? The neoliberal reforms it has imposed on countries around the world have been disastrous. The UK’s vote in June to leave the European Union, combined with an extraordinary backlash against trade agreements as manifested in the US presidential election, has set off an unprecedented public debate about globalization and even some of the neoliberal principles that it embodies in its current form. It is therefore of great relevance to look at what is happening to one of the most powerful promoters of neoliberal globalization in the world economy: the International Monetary Fund. Neoliberalism refers to a set of policies that the IMF has been promoting all over the world for decades. These include tighter fiscal and monetary policies (sometimes even when the economy is weak or in recession); an indiscriminate opening up of countries to international trade and capital flows; the abandonment of state-led industrial and development policies; privatization of public enterprises; and various forms of deregulation, including financial. It’s not exactly a household word in the United States, but in South America in the 21st century, for example, most of the winning presidential campaigns were against it. There were some solid reasons for their opposition: During the last two decades of the 20th century, when neoliberal reforms were being implemented, income per person in Latin America barely grew. Whereas in the previous two decades—when governments did most of the things that neoliberalism was designed to reverse—income per person nearly doubled. If we look at the world as a whole during the decades of neoliberal reform (1980–2000), there was also a sharp slowdown in economic growth in the vast majority of low- and middle-income countries, as well as a decline in progress on such indicators as life expectancy and infant mortality. So yes, neoliberalism appears to be worse than oversold. As a result, the IMF—the most powerful institution promoting neoliberal policies—lost most of its influence in the world during the 21st century. This may seem surprising at first, since the IMF more than tripled its resources, from $250 billion before the Great Recession to $750 billion by 2009, and has even more today. But the majority of its lending—with policy conditions that have once again proven disastrous—is in Europe. And in Europe it is a subordinate partner, with the major decisions regarding its loans and conditions made by the more powerful European governments. The real power that it has had over economic policy has been in developing countries, with the middle-income countries having mostly escaped. After its mishandling of the Asian financial crisis, the IMF was harshly criticized by prominent economists for the first time. Much of this exodus by middle-income countries took place after the disastrous, IMF-supervised mishandling of the Asian financial crisis of 1997–99. The fund took harsh criticism from prominent economists for the first time, and also from its own Internal Evaluation Office. As in the eurozone since the Great Recession, the fund saw the crisis in Asia as an opportunity to implement more neoliberal reforms, despite the fact that the region’s financial deregulation was a major cause of the crisis. After the Asian crisis, the affected countries (e.g., Thailand, Indonesia, South Korea, and Taiwan) and many other middle-income countries decided to accumulate enough international reserves so that they would never have to borrow from the IMF again. One side effect of this response has been years of sizable trade deficits in the United States, with associated job losses. It’s nice to see that a few IMF economists finally recognize some of the failures of neoliberalism. In recent years there has been some other research at the Fund that acknowledged major mistakes—for example, underestimating the negative impact of austerity in Europe; and challenging some prior IMF orthodoxy, such as opposition to capital controls and overly rigid central-bank policies. And on July 28, the IMF’s Internal Evaluation Office released a report on some of its surveillance and intervention in the eurozone crisis. It noted that the IMF “did not foresee the magnitude of the risks” that the crisis would bring, was overly optimistic about growth forecasts in Greece and Portugal, and failed to provide a realistic view of Greece’s debt sustainability. But the report’s criticisms vastly understated the long-term damage that the IMF and its troika partners (the European Central Bank and the European Commission) inflicted on Europe during the crisis years. Despite the changes in the IMF’s research department, the fund’s policies have been resistant to change. Out of 41 countries that received IMF loans during the world recession of 2009, 31 carried fiscal or monetary policy conditions (or both) that would be expected to slow the economy when it was weak or already in recession. Why would we expect an organization run by rich countries to prioritize the interests of the less fortunate nations? But why would we expect an organization run by the finance ministries of rich countries to prioritize the interests of the less fortunate nations of the world? Or to help them get through a balance-of-payments crisis without trying to reshape their economies as the rich countries would like to see them? Do we expect the US Chamber of Commerce to fight for the rights of unions and workers in the United States? In general, countries do better when they have sovereign control over their most important economic policies. This is a lesson that Americans learned not long after independence, and something that most of the Eurozone is painfully relearning today. 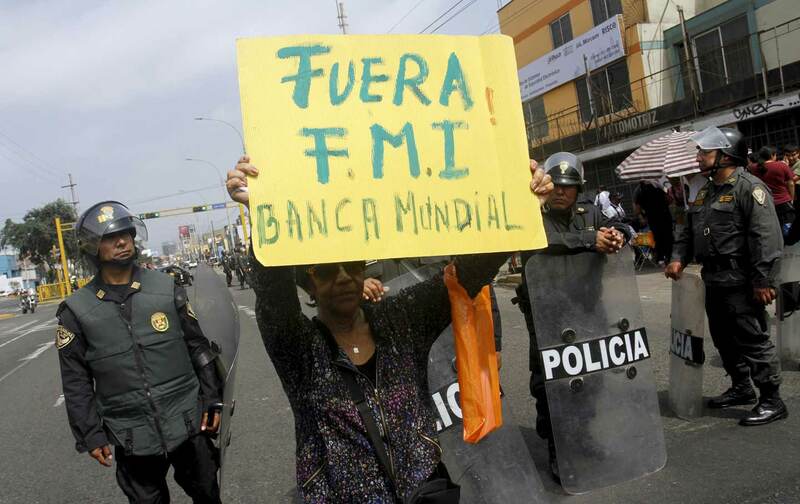 The IMF’s loss of influence over the economic policies of middle-income countries was one of the most important changes in the international financial system in decades. It is likely that this contributed to the growth rebound of developing countries in the first decade of the 21st century. And one of the biggest boosts to this rebound—which has slowed in recent years—came from China. Ironically, this was the country that most avoided the neoliberal reforms of the prior decades, achieved the fastest economic growth in world history, and became the world’s largest economy. The most recent reform of IMF voting shares was very slight and did nothing to diminish the control of the United States and its rich-country allies. On the other hand, the low- and middle-income countries haven’t used much of the voice and vote that they do have within the fund. This is in sharp contrast to the World Trade Organization, where developing countries have formed blocs to defend their interests against the rich countries. They have successfully blocked policies that would harm them regarding agriculture, financial deregulation, and policy space generally. They have also won victories over the pharmaceutical companies, expanding access to essential medicines. So there is room for significant “harm reduction” at the IMF—if enough governments are willing to make the effort. But reform that would give the majority of the world a proportionate voice in this institution is still a dream. Until then, more countries voting with their feet by avoiding any lending agreements with the Fund will remain the most important path to IMF policy reform.